Let us remember the day when you celebrated your last birthday or a close relative's birthday. This seems to bring forth all memories of the felicitous time that you were together and enjoyed. Even at the late evening party, as an enthusiast, you must have clicked all those momentous experiences into pictures using your personal digital camera. Suppose later you found something wrong with the camera that you used for taking birthday pics and instantly, the memory card too became unreadable. Your shoulders may slump at this time and you may feel like emotionally bankrupt. You could see nothing on the digital camera and you wonder how to make things right by recovering lost birthday pics; at least a few of them. To salvage something out of nothing, you may try inserting your memory card to another camera or your laptop. But this only leads to a tension headache when the card displays some weired error messages on the laptop or desktop, to which you have attached your camera. This is enough for a pressure situation. Let us now dig into the solution and the safe and fullproof solution is to efficiently recover lost birthday pics is Stellar Photo Recovery. The software provides comprehensive set of features to enable you effectively recover digital photos of your birthday from your hard drive or any memory card of a digital camera. The professional pics recovery software supports raw recovery from all major camera brands, including Nikon, Canon, Olympus, Kodak, Panasonic, etc. The software also facilitates taking an exact snapshot of your storage device for recovering birthday pics at any later point of time. Recovers images and media files from hard drives, digital cameras, USB drives, memory cards, etc. Supported video formats: AVI, WMV & ASF, MP4, M4V, 3GP, MOV, MPEG, DV, 3G2, M4B etc. Supported audio formats: WAV, MP3, AIFF, RPS, MIDI, M4A, M4P, AU, OGG, WMA, RM etc. 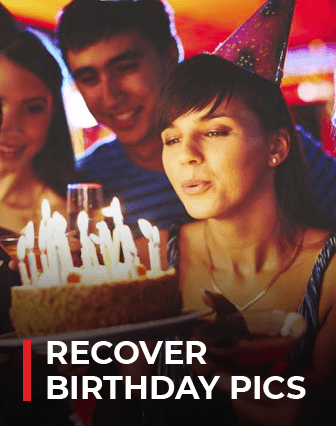 Recovering your lost Birthday Pics becomes more easy and fun now!